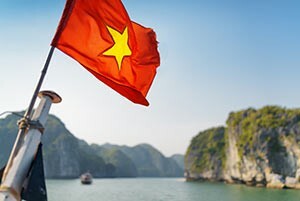 The flag of Vietnam fluttering on a ship in the South China Sea. The agreement allows for a "rotating" U.S. military presence on five Philippine bases in the South China Sea. China believes this kind of presence is tantamount to "militarization." U.S.-Philippine cooperation should "not be targeted at any third party nor harm other nations' sovereignty or security interests," China warns U.S. officials, picked up by Reuters yesterday. 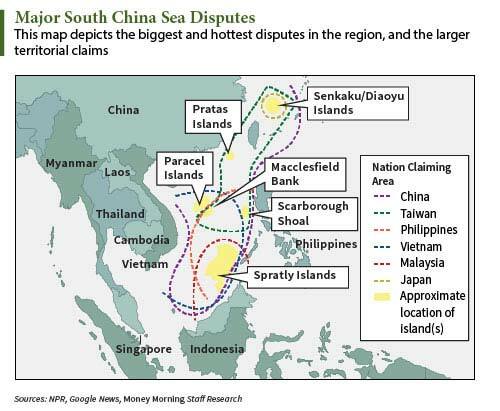 But the security of all the nations affected is part of the larger South China Sea dispute. You see, the Red Dragon claims as its own most of the waters and resource-rich archipelagos surrounding neighboring countries like Malaysia, the Philippines, Taiwan, and Vietnam. These smaller, far less powerful nations believe those waters and territories, however, belong to them. China went on to admonish the United States for double-speak. "I also want to point out that recently the U.S. military likes to talk about the so-called 'militarization' of the South China Sea," Chinese Foreign Ministry spokeswoman Hua Chunying said at a conference held yesterday, according to Reuters. "Can they then explain, isn't this kind of continued strengthening of military deployments in the South China Sea and areas surrounding it considered militarization?" In other words, Hua admitted that the Chinese government believes the U.S. boasts about "militarizing" the South China Sea stateside — while denying such is the case to China. Thus far, China has not obstructed these trade routes; at least, not yet. But it is beginning to look more and more like a blinking contest in the South Pacific. 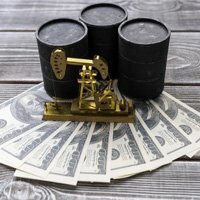 For up-to-date information on the South China Sea dispute – including how it affects your investments – follow us on Twitter @moneymorning, or like us on Facebook.